Born at home in Bristol U.K. in 1936. Janet did all her nursing training in the U.K., starting at 18 years of age at Bristol Royal Infirmary for her Registered Nurse The Midwifery Training at St. Thomas London and Bristol. 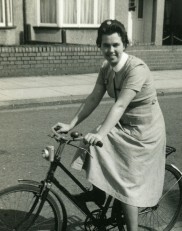 She worked as a District midwife and then spent two and a half years in Australia. On return to U.K. she did the Public Health Course at Bristol University and spent 3 years in Public Health. Janet and Richard met in 1968, married and emigrated to Canada with the first winter in Midland, ON. 1969 brought them to Cobourg, Richard to Winchesters, then Westinghouse and General Foods, and Janet spent 22 years at Cobourg District Hospital. Richard predeceased Janet in 2003. There will be a graveside service for Janet at Fairview Cemetery, Grafton on Tuesday October 30, 2018 at 1:30 p.m. Memorial donations may be made to PrimRose Donkey Sanctuary, ORBIS Alliance for Sight, or Lions Foundation of Canada Dog Guides. Condolences received at www.MacCoubrey.com. Tuesday October 30, 2018 at 1:30 p.m.